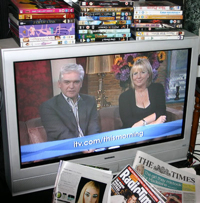 Studying media is about watching, reading, discussing and evaluating media texts such as films, television and radio programmes, newspapers and magazines, and advertisements. An important aspect of Media Studies is evaluating (this is called ‘reading’) a media text to find out what it is trying to say to the audience, and how that message is being communicated. The first AS module is usually known as ‘Reading the media’. In the course of this A level you will also create and produce a media text or product. This may be a video, a print advertisement or a journalistic piece. To help you produce a really interesting and high quality media product you need to fully understand the Key Concepts - they are the tools you need to research and produce media products that excite an audience. Students should have access to a DVD player either as a whole class or in smaller groups if you have access to several viewing facilities. Many computers have DVDs and a small group can watch a film together - or the first ten minutes of a film and each group can have a KC to analyse. Suggested DVDs of recent films: Mission Impossible III, Wedding Crashers, Inside I’m Dancing, Collateral, The Prestige, Little Miss Sunshine and Mean Girls. This list coves several genres and is not meant to be anything other than a suggestion of films that are known to interest VIth form students. Many teachers like to study horror and the Scary Movie and Scream franchises work well. The exam boards prefer students to write about modern films, with some historical film context. TV programmes: Ugly Betty, House, Hollyoaks, Skins, Scrubs, selected dramas, and carefully produced documentaries about health, teenage issues, climate change etc. Magazines: there are two magazines aimed at the younger female teenage market: Bliss, Sugar. Students can research other print texts that interest them.